Today, I want to share a nifty online tool from COLLEGEdata that can help you get a sense of how much a school will cost your family. To use it, all you need to do is plug in your expected family contribution or EFC. Your EFC is what you will be expected pay, at a minimum, for one year of college. To use COLLEGEdata’s net cost calculator you will have to register, but it’s worth that extra step. To illustrate what you can find, I’m using examples from two schools in eastern Pennsylvania: Drexel University in Philadelphia and Muhlenberg College in Allentown. I selected these two schools to contrast the financial aid practices of a stingy school versus a generous one. To get a ballpark net price of both schools, I selected an EFC of $18,000, which would represent the EFC of a middle-class family. The EFC is supposed to indicate what a family would be able to afford, in this case $18,000, for one year at college. Even though the family could afford $18,000, they would most likely have to spend $39,942 a year to attend this private university in Philadelphia. That would be a tremendous financial burden. So why would this family have to pay so much — or rather end up borrowing so much? Drexel typically only meets 61% of the typical student’s financial need. That’s shockingly low. And the school meets part of that need by including loans in its financial aid packages. The average need-based grant (free money) at Drexel is just $14,844. There are some lucky students who get their full need met, but they represent only 39% of the freshmen class. What also should alarm potential students is that Drexel won’t divulge what the average indebtedness of its graduates are. When you see expensive schools such as Drexel, Northeastern University, Fordham University and New York University declining to reveal this figure, be very cautious. In reality, these four schools are among the least affordable in the country, according to federal statistics that you can see at the new College Affordability and Transparency Center. Despite Drexel’s mediocre financial aid packages, this is a hot school right now and applications have been soaring. The Chronicle of Higher Education wrote a story about how successful the school is in attracting applicants through its VIP program. Obviously students aren’t asking a lot of questions about financial aid! While the sticker price at Muhlenberg is very close to Drexel’s, the net cost to attend this liberal arts college is far lower — $25,994. The hypothetical family would have to kick in an extra $7,994 a year rather than $21,942 at Drexel. What’s the difference? Muhlenberg typically meet 92% of a student’s demonstrated financial need and just as importantly 93% of the freshmen class had their full need met. What’s more, Muhlenberg students graduate with debt ($18,542) significantly lower than the national average of $23,000. Please don’t assume that if your EFC is $18,000, you will get the financial aid packages described above at Drexel or Muhlenberg. 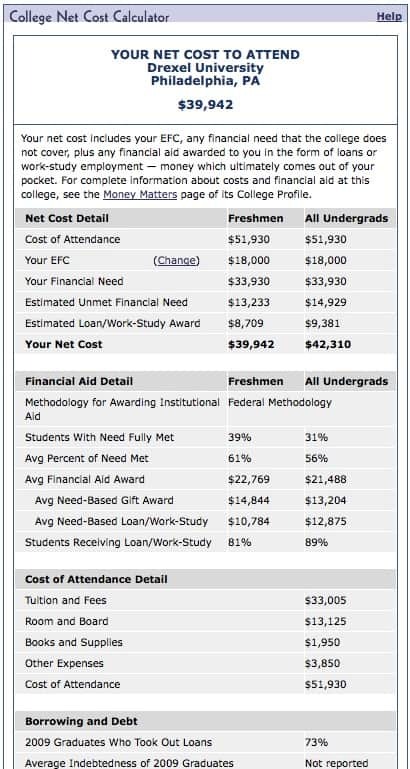 COLLEGEdata used average financial aid statistics to create these estimates. What you need to do is use the net price calculator for each school to get a better idea, but these number should definitely be in the ballpark. Before your child falls in love with a school, check the financial aid numbers. Don’t wait until you receive the financial aid package in the spring of your teenager’s senior year in high school. By then it can be too late. I got really excited when I saw this. I thought it said StingyCampus, an company that I intern for. It’s kind of like a one stop shop for students. What besides EFC would contribute to a school being stingy?